New York is the most famous city in the world. LA may be the city where most films are made, but New York is the city where most films are set. The New York skyline is permanently etched into the minds of anyone with even a passing interest in film or TV, sometimes accompanied by a giant ape, sometimes not. Along with London, New York is one of only 2 “World Cities.” A designation awarded to only the world’s most influential cities. One of the greatest things about New York from a tourist standpoint is that apart from the main, obvious tourist destinations almost everyone has their own personal must see spots. Fans of certain TV shows or films will have parts of the city that might seem completely random to someone else but has a special meaning to them. This also works in another way, one of the greatest things about New York, even for locals, is walking around and discovering a location you may have seen on TV years ago or even the night before. The reverse of this is also true, even on your first visit to New York you may find yourself plagued with deja vu, wondering where you recognise a seemingly insignificant street from. As you’d expect from the world’s biggest city, New York has an unbelievable amount of hotels to choose from, catering to all kinds of tourists. There is an area of New York for everyone, from cheap hotels in the small ethnic communities like Chinatown to the chic hotels of Manhattan where the stars themselves stay whilst visiting. 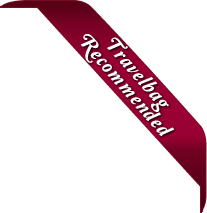 We here at Travelbag pride ourselves on being able to find the right hotel for you, no matter what your preferences are. With so many hotels in New York it can be a daunting task to pick which one is right for you. That is why we have picked our favourites in each price bracket to make your holiday planning easier. 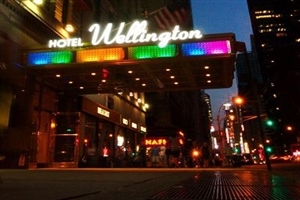 For cheap hotels in New York we recommend the Wellington Hotel in Midtown. Located just 4 blocks from 5th Avenue and not much further from Times Square and Broadway, you will not find a hotel with a better location in this price range. Those who want to stay in Manhattan will love The Lexington Hotel, a popular hotel that is well known for personalising it’s service to each guest, a great reprieve from a city that has a less than stellar reputation for politeness. If you want to get even trendier than Manhattan then The Standard in The East Village is our personal vote for best hotel in New York. This hotel features pure luxury and some would say that the place screams ‘New York’ nearly as much as Lady Liberty herself. Visit The Empire State Building at night. The Empire State Building may be one of the most iconic tourist traps in New York but not many people know it is open until 12-2am depending on the day. This means very little tourists and an alternate, night time view of the city that may even be new to some of the locals. Visit the Brooklyn Brewery. Brooklyn Lager is quickly becoming a very popular beer in the UK, why not earn yourself some hipster points that the local Brooklynites would be proud of by visiting the place it is made. Visit the Brooklyn Night Bazaar. This artisan market is located in the heart of the famous bohemian neighbourhood and features a great selection of independently made goods. A great alternative to 5th Avenue. Whatever you choose to do with your time in New York, book your 2019 or 2020 hotel stay with us today and make sure your accommodation is as memorable as the activities you enjoy while you’re there. 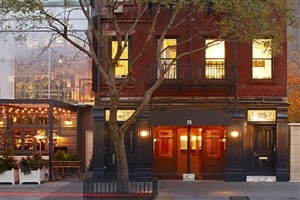 Here is just a selection of our favourite and cheapest hotels in New York. Please use our search panel above to find your perfect choice. Boasting a central location, The Stewart Hotel is a modern hotel with luxurious rooms and a short walk from Broadway, the Empire State building and Penn Station to connect you to the rest of the city. With an art studio theme, the boutique hotel has a vibrant feel in an ... energetic part of the city. Luxurious suites and guestrooms, complete with mod cons, a kitchenette and working space, are a comfortable base while you visit the ‘city that never sleeps’. Friendly staff, a fitness centre and a restaurant are all on offer at The Stewart Hotel but it is the location, more than anything that makes it the ideal place to stay. Chelsea is a trendy district that boasts both style and affluence with markets, art galleries and the piers. A short walk from the hotel will have you at Madison Square Garden, Fifth Avenue, Time Square and the world-famous Broadway Theatre District. Need to get a bit further afield? All you have to do is get to Pennsylvania Station and hop on the subway. Whether it is a romantic city break or a family adventure, The Stewart Hotel offers great rooms in the perfect location that can serve as your springboard for exploring the bright lights of New York City. 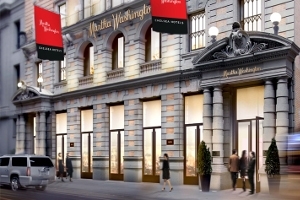 Whether you are staying in one of the 85 one-bedroom suites or the other 515 decorated rooms, you are sure to get a convenient and comfortable stay when choosing the Wellington Hotel in Midtown Manhattan. 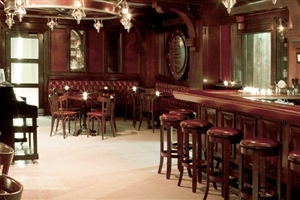 It has some of the finest New York City landmarks on its doorstep as you ... start to explore the ‘Big Apple’. 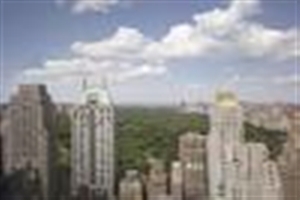 Central Park is four blocks away while Fifth Avenue, Broadway and Time Square are within walking distance. The Rockefeller Center is also easily accessible while the subway station next door opens up a world of possibilities. 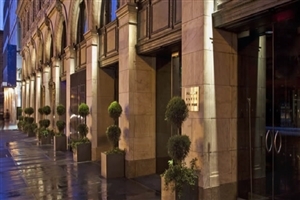 A traditional hotel, it works as a good base for seeing one of the best cities in the world. Offering value for money and a range of facilities, there is also a restaurant and café on-site as you take stock from the prime Midtown location. An iconic fixture of the New York skyline, the historic The New Yorker, A Wyndham Hotel stands proud as having hosted numerous famous figures over the years. Rising into the New York skyline, the Wyndham New Yorker Hotel is located on 8th Avenue in Midtown, Manhattan, putting it within close ... proximity of many New York attractions, including the Empire State Building, Madison Square Gardens and Times Square. 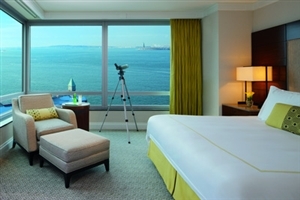 The New Yorker, A Wyndham Hotel offers classically designed rooms and suites with generous amenities and striking views to be enjoyed across the city. 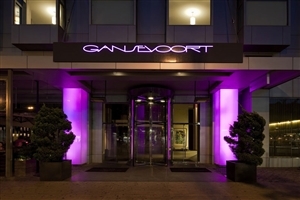 Located deep amongst the historical backdrop of New York City’s iconic Meatpacking District, the Gansevoort Meatpacking Hotel makes its mark as the first luxury hotel of its kind in the area, seamlessly combining modern comforts with the old world aspects of the surrounding setting. 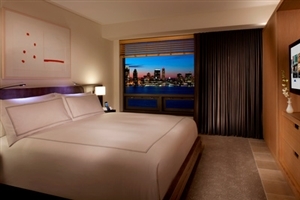 Boasting some of the most spectacular ... views of the Hudson River and Manhattan city skyline, the hotel is a great escape for those seeking to get the most out of their time spent in ‘The Big Apple’. Featuring a myriad of soothing and recreational facilities, a selection of in-house dining options and a total of 186 plush-filled rooms and suites, this is one hotel that is sure to impress any and all travellers. Get the most from your New York holiday with a stay at the luxurious Marriott Marquis, ideally positioned on the edge of the spectacular Times Square. Stay in the heart of Manhattan with the Marriott Marquis, a hotel that rises to 49-storeys and is positioned within three blocks of more ... than 30 Broadway theatres, including the in-house Marquis Theatre. Beyond its excellent central location, the Marriott Marquis offers luxurious and spacious guestrooms, generous facilities – including a state-of-the-art gymnasium – and an excellent choice of dining options. Experience the New York holiday of a lifetime with a stay at the Watson Hotel, located close to the centre of Manhattan and many of the city’s premier attractions. One of only a few hotels in New York to offer a swimming pool, its location on the 18th and top ... floor of the Watson Hotel makes it the ideal place from which to enjoy stunning views and a respite from the bustling city below. The Watson Hotel offers spacious and comfortable accommodation, plus an on-site restaurant and bar. 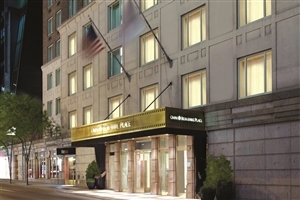 A classic New York hotel blending modern sophistication with traditional touches, the Parker New York represents the finest in five-star uptown elegance. 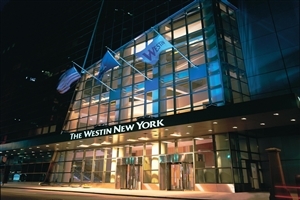 Ideally placed for guests to simply stroll to attractions as Central Park, Times Square, Fifth Avenue and Broadway, Parker New York complements its central location with spacious and ... stylish guestrooms, and excellent facilities, including a pampering spa, a traditional barbers shop and salon, a swimming pool, health club and fitness centre. Better still, Parker New York offers two on-site restaurants, including Norma’s, one of Manhattan’s best-known breakfast hangouts. The Row NYC is a stylish hotel located deep in the centre of the lively Times Square, combining luxurious sophistication with city grit to create a beautiful blend of the two for guests to embrace in what can be considered an unforgettable experience in New York City. 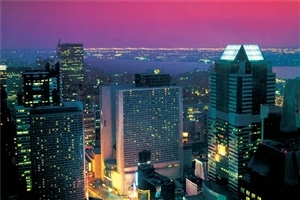 Rising through the ... New York skyline, the hotel has become a renowned icon itself over time in the city. With the interior styled by a theatre architect, the decor fuses the elegance of elite colours with contemporary artistic overtones; with the stainless steel, warm wooden hues and glass panes offset by the light sculptures, inspired paintings and photography installations for a display of chic design. 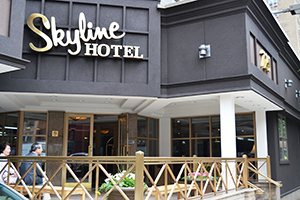 Located among the many wonders of vibrant Midtown Manhattan, the Skyline Hotel New York is an excellent choice for travellers looking to immerse themselves in the sheer splendour and vibrancy of “The Big Apple”. Explorers can check out several highlights dotted around the busy metropolis, such as the Broadway theatres, ... the natural beauty of Central Park and all the renowned entertainment outlets and dining venues in between. The hotel is elegantly decorated with plush furnishings and stylish decor to create a utopian setting that serves as a haven away from the hustle and bustle of New York City. Along with a range of facilities on hand, the hotel also sports an exquisite dining venue and 232 guestrooms and suites, each a spacious haven unto themselves, perfect for any and all travellers. 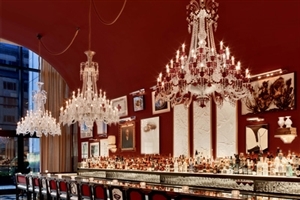 Put yourself right in the heart of Manhattan with a stay in the stylish The Redbury New York, a fashionable boutique base for a dream New York holiday. 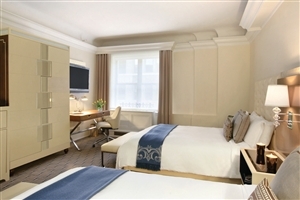 Well placed for guests to get out and explore this extraordinary city with the Empire State Building, Times Square and Central Park merely ... a few blocks away, the The Redbury New York offers chic and functional guestrooms to suit every request and budget, while generous facilities include Wi-Fi Internet access, a fitness centre and business services. 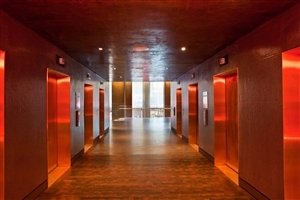 Situated just off Cooper Square in New York’s energetic East Village, The Standard serves as a welcoming escape that reflects the vibrancy of the surrounding neighbourhood with all of its intricacies and charm. 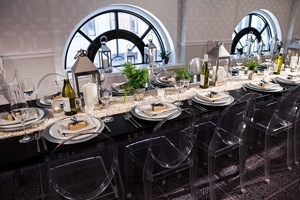 Boasting 21 stories that reach up into New York City’s skyline, the hotel grants amazing views of ... the various highlights and landmarks scattered throughout the area, while the warmth and comfort of each accommodation and in-house dining venue makes this urban retreat all the more appealing. A historic icon of the New York skyline, Essex House remains synonymous with luxury, prestige and quality to this day. 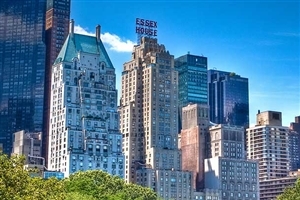 With its distinctive Art Deco design traits, seamlessly blended with modern elegance, the JW Marriott Essex House Hotel represents the pinnacle of luxurious hospitality in a fabulous city centre location, ... close to Central Park, the Lincoln Center and Carnegie Hall. Choose JW Marriott Essex House to be lavished by stylish, comfortable guestrooms, enjoy excellent cuisine, take advantage of impressive facilities and admire stunning New York vistas. With a privileged location on the edge of the iconic Times Square, the Novotel New York Times Square Hotel takes you to the heart of the ‘Big Apple’. Located in New York’s famed theatre district, the Novotel New York Times Square is the ideal base from which to explore and ... experience the fabulous Manhattan, with Central Park, the Empire State Building and Times Square mere walking distance away. 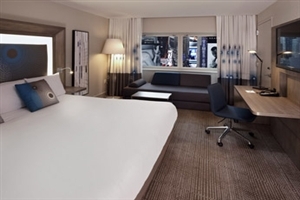 With spacious and well-appointed guestrooms, generous amenities and the Supernova Restaurant and Bar, Novotel New York Times Square has everything you need for a memorable New York holiday. In 1924 the doors of the grandiose hotel opened to the public giving way to opulence and comfort in the heart of the city. While the hotel has since been renovated, the meticulously restored spaces and attentive staff still reflect the pomp and exuberance of the Jazz Age. Marble columns, ... gilded adornments, crystal chandeliers and paintings of the eponymous president of the United States, Theodore Roosevelt, adorn the hotel’s interior. 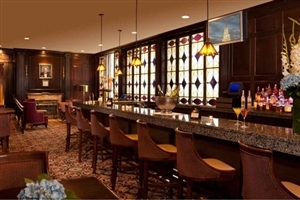 Some of jazz greats launched their careers in the hotels’ spaces, and if the lobby looks familiar, that’s because it has served as the setting of several movies, including “Wall Street,” “The French Connection,” “Maid in Manhattan” and “Men in Black 3.” Guests are invited to create their own motion picture-worthy experience during their stay. 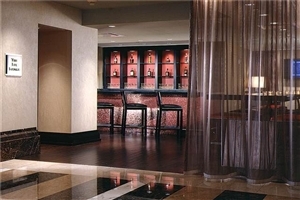 The hotel boasts 1,015 spacious rooms which includes 33 luxury suites. Guestrooms are outfitted with mahogany furniture, rich hues and plush bedding that make for a warm and inviting atmosphere. Guests can enjoy HD TVs, wireless internet, a desk and chair and personal amenities, as well as access to a multilingual staff, a fitness centre and fine dining options. 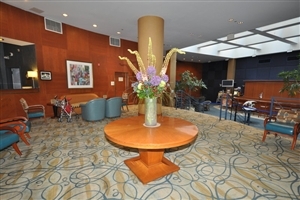 Situated in the heart Manhattan, this magnificent hotel is close to many of New York City landmarks, including Grand Central Station, Broadway, Rockefeller Center, Central Park and the Fifth Avenue shops. 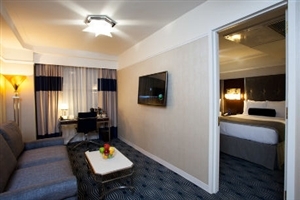 Smart, chic and sophisticated, the fashionable Lexington Hotel brings boutique style to Manhattan. Enjoy the New York holiday of a lifetime with at stay at The Lexington Hotel, the latest member of the Autograph Collection, where vibrant guestrooms and suites effortlessly combine traditional touches with modern amenities. 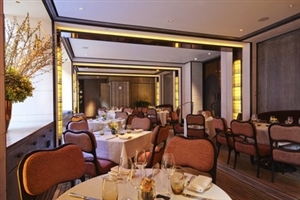 Known for its ... exquisite attention to detail and personalised service standards, The Lexington offers a selection of fine dining and bar venues inside the hotel, as well as a 24 hour fitness centre and business centre. 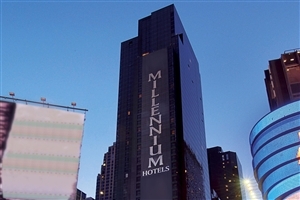 Located on the edge of the iconic Times Square, the luxurious Millennium Broadway New York invites guests to get more from their New York holiday by staying in the beating heart of this magnificent metropolis. 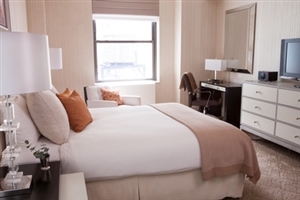 Take a bite out of the Big Apple by exploring the nearby Broadway theatres, scaling ... the Rockefeller Center and strolling through Central Park, before retiring to your spacious and lavish guestroom or suite, many of which feature unforgettable skyline views. In addition, the Charlotte Restaurant and Bar, the fitness centre and Wi-Fi Internet access will ensure an unforgettable holiday. 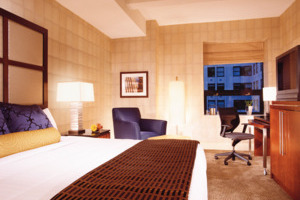 The Paramount Hotel is a warm and welcoming escape nestled deep at the heart of Midtown Manhattan. Situated in close proximity to Times Square, the hotel is ideal for those looking to immerse themselves in the vibrancy and excitement of “The Big Apple” and pay a visit to the city’s ... most iconic landmarks. Boasting a total of 597 plush-filled accommodations, in-house dining options and several facilities to utilise, this architectural wonder is the perfect place for families, business travellers and couples to experience New York City with style. Set deep in the middle of it all, the Crowne Plaza Times Square is an amazing holiday destination for those looking to delve into the hustle and bustle of New York City in style. 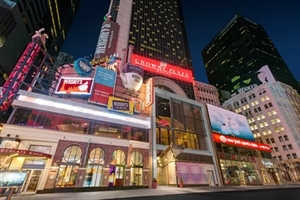 Located in Times Square, one of the busiest intersections in the world, the hotel provides a ... great opportunity for explorers to uncover the many wonders of “The Big Apple” that stem outwards from the square, while the hotel itself offers a reprieve of peace and serenity after a day’s exploration. The hotel features an array of facilities for guests to utilise along with some dining venues to choose from so that travellers will never be out of options. Housing a total of 795 guestrooms and suites, all elegantly decorated with the finest fittings, travellers are sure to be impressed with this spectacular New York hotel. 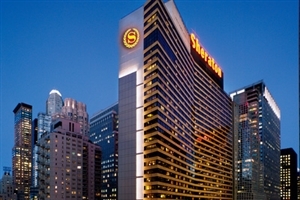 Situated in a prime location near the very heart of Times Square, the Sheraton New York Times Square Hotel brings comfort and convenience to travellers the world over, providing everything a discerning traveller may need to get most out of their New York City experience. The hotel brings together the ... electric vibrancy of New York City and combines it with a plethora of modern amenities to entice even the most discerning travellers, boasting a number of plush-filled rooms and suites to choose from as well as in-house dining options. Whether you want to explore the surrounding area or simply ease back and relax, the Sheraton New York Times Square Hotel has you covered. The iconic Art Deco exterior means that the hotel is eye-catching both inside and out. A few footsteps from the bustle of Times Square, the Edison Hotel gives you a prime location for an adventure in the ‘Big Apple’. Chances are that you will spend your days out and about ... exploring New York City, and this hotel is a great springboard. Walk to Central Park, Broadway, the NBC Studios and the Rockefeller Center or get the subway from a nearby station to head to a different part of town. Back in the hotel, you have a restaurant and bar to refuel and unwind in, rooms complete with flat-screen televisions and air conditioning as well as wireless internet access across the complex. It is the location that makes the Edison Hotel, which was built in 1931, such a great place to stay but inside there is also plenty of reason to choose this for your visit to New York City. The automated check-in system and luggage robot start you off in this ultra-modern, chic hotel in a prime position in New York City. When staying in the Big Apple, hotels tend to be rated on location, affordability and convenience, and the Yotel ticks all these boxes. Once you have checked ... in, you head to your compact, bright ‘cabin’ that comes with a great use of space. This clever usage means that there is plenty of room for a work desk, a large flat-screen television and a queen-sized bed even in the basic room; a functional base for you to explore the city. 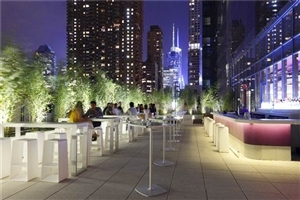 The hotel restaurant is a fourth floor terrace and boasts great views across the Hudson River, perfect for a sunset, and this is ideal for getting fed and watered any time of the day – along with the other chic bars. With all this crossed off, the only other thing to do is to get out there and explore New York City. Close to the hotel, you have Central Park, Chelsea Piers and the Manhattan Waterfront Greenway for green exploration but the main landmarks of the concrete jungle like Times Square, Broadway and the Empire State Building are all within walking distance. Settled in the centre of Midtown Manhattan, The Westin New York Grand Central brings the wonder and excitement of New york City straight to you while providing plenty of comfort, style and attentive service. Boasting unsurpassed access to the iconic Grand Central Terminal, Fifth Avenue and the United Nations, the ... hotel is perfect for those looking to immerse themselves in the sights and sounds of 'The Big Apple'. Settle in to your plush-filled accommodation, relax with the soothing services and facilities, and dine fine with the in-house eatery before delving deep into the heart of one of the most incredible cities in the world. At the corner of Park Avenue South and East 29th Street, the former Marathon bank building has been razed to make way for a new 249-room hotel - Gansevoort Park Avenue NYC. 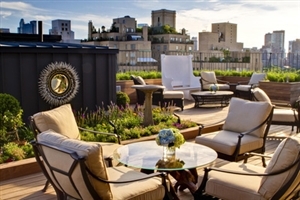 The hotel's rooftop, like that of Gansevoort Meatpacking NYC, is bound to be one of the most notable in ... New York. Designed by the Stephen B. Jacobs Group, P.C. and Andi Pepper Interior Design, the handsome 20-story stone, glass, and metal panel building, punctuated by Juliet balconies, will incorporate similar signature design aspects as its sister hotels. The 40-foot heated indoor/outdoor rooftop pool will be open exclusively to guests during the day, and will transform to one of the city's hot spots of New York nightlife, with its connected tri-level bar, outdoor space, and two hospitality/event suites / VIP lounges. Rooftop pool is open year round. The third floor offers larger banquet and meeting spaces, and exhale Spa will open a location in the hotel, offering its proprietary mind body classes. The ground floor will house both a 10,000 sq. ft. Ristorante Asellina, from The ONE Group, as well as a separate two-story liquor bar, both designed by the award-winning iCrave design firm. The restaurant, with its rich materials of wood, stone, and polished concrete, uses earth-tones, greenery, and fireplaces, to provide a warm, home-like, musically-enhanced environment in which to dine and lounge. Couches replace banquettes in the main dining area, and provide comfortable and inviting seating in the Living Room lounge. Ideally situated deep in the heart of the sprawling metropolis of New York City, the Park Central Hotel provides comfort and quality to travellers seeking to get up close and personal with the sights and sounds of one of the most vibrant locations in the world, and with such easy ... access to local hotspots like Carnegie Hall, the Museum of Modern Art and spectacular Broadway musicals, this is one holiday haven not to be missed. Designed with modern overtones and granting an abundance of space, the hotel is great for explorers and relaxation fanatics alike, with a myriad of facilities at your disposal along with several in-house dining options and a variety of lavishly fitted accommodation to choose from to ensure a memorable time no matter the occasion. Situated alongside the waterfront at Battery Park, The Ritz-Carlton Battery Park brings together some of the most modern, comfortable conveniences in all of New York City. With a close proximity to Wall Street, the South Street Seaport and 9/11 Memorial, the hotel is great for avid adventurers, while the gorgeous ... views of the harbour and Statue of Liberty make some of the many room types the perfect setting for a New York escape. Spend some time exploring the surrounding area, visit the in-house eatery or make use of the numerous facilities to bring your dream holiday to life at The Ritz-Carlton Battery Park. Set within the beating heart of one of the most bustling and lively intersections in the world, The Westin Times Square is a luxurious and distinct hotel that brings guests closer to the pulse of New York City than ever before, offering gorgeous views that encourage guests to immerse themselves ... in the vibrant ambiance of “The Big Apple” and discover its many sights and sounds. The hotel itself is elegantly furnished and showcases some of the best combinations of modern decor along with plenty of space and privacy for those who want it. Featuring a host of facilities to choose from, a number of guestrooms and suites, and several dining venues that concoct exquisite American dishes, this hotel is a veritable city paradise for families, couples and business travellers alike to unwind in after a day of exploration. A modern, chic and sophisticated retreat in one of the world’s most extraordinary cities, The James New York, NoMad is an enticing New York City hotel for the discerning traveller. Discover stylish, comfortable and fashionable guestrooms and suites at The James New York, NoMad, feast on award-winning cuisine and enjoy ... dedicated levels of service to ensure you enjoy the New York holiday of a lifetime. 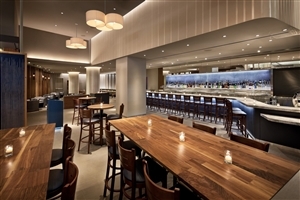 Located in Manhattan’s emerging NoMad (North of Madison Square Park) district, The James New York, NoMad has everything you need for a fantastic New York adventure. Enriched with historical ties and serving as inspiration for artists, the Benjamin Hotel New York invites travellers the world over to ease back and enjoy the residential style ambiance of this luxurious holiday haven where an attentive level of service and lavish furnishings fuse with the sights and sounds of ... New York City to guarantee a most memorable occasion. Situated deep in the midtown east sector of the city, the hotel provides easy access to numerous local landmarks just waiting to be discovered, from the renowned Grand Central Terminal and vibrant Rockefeller Centre to the bustling highlights of Saks Fifth Avenue and the wares of Bloomingdale’s, business and leisure adventurers are sure to find what they’re looking for. The hotel itself is a paradise of comfort, hosting a wide range of facilities, an in-house dining venue and a variety of guestrooms, studios and suites that are sure to appeal to any and all visitors during their time spent in “The Big Apple”. Settled deep amongst the hustle and bustle that permeates throughout the heart of midtown Manhattan, the Omni Berkshire grants easy access to many of New York City’s most iconic landmarks while also providing plenty of comfort, style and great levels of service for visitors to make the most of. Boasting ... a wide range of facilities and a total of 398 plush filled accommodations, the hotel is a great choice for travellers looking for a modern, city getaway to start and end each day, and with easy access to such local hotspots as Central Park, Rockefeller Centre and the Broadway district, discovering the best of “The Big Apple” has never been easier. Situated alongside the iconic landmarks of Lower Manhattan, the Conrad New York brings a sense of luxury and sophistication to Battery Park City, offering convenience to those looking to explore and relax in style. Hosting 463 lavishly fitted suites, several in-house dining venues and plenty of recreational facilities, the Conrad ... is the perfect urban escape for any and all travellers, and with such local landmarks as the New York Stock Exchange, South Street Seaport and City Hall all in such close proximity, this is one “Big Apple” escape to remember. Consisting of 26 floors filled to the brim with luxury and comfort, the Renaissance New York Times Square Hotel epitomises the vibrancy of this significant intersections while giving guests the opportunity to languish in style. Showcasing a variety of elegantly fitted accommodations, an in-house eatery and an extremely attentive level ... of service, the hotel is perfect for those looking to get something special from their stay in the heart of “The Big Apple”, and with so much to see and do all in such close proximity, you can bet an unforgettable occasion is standard with the Renaissance. Settle back into the literal lap of luxury amongst the towering wonders of New York City with a stay at The Knickerbocker Hotel. Designed with the utmost care and consideration, the hotel aims to appeal to any and all travellers looking for something extra special to enhance their NYC experience, ... serving as an urban haven that provides peace and comfort as well as convenient access to several highlights. 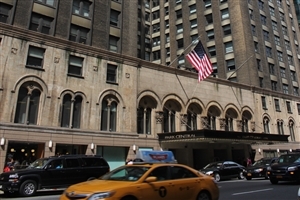 Spend some time getting comfortable in your chosen accommodation, dining fine at the in-house eateries or discovering such landmarks as Rockefeller Center, Central Park and the Museum of Modern Art, but no matter what you decide to do, you’re in for the time of your life with The Knickerbocker Hotel. Bringing its own sense of flair and style to New York City’s Upper East Side, The Surrey serves as the only Relais and Chateaux boutique hotel in the city, providing peace and a discreet service for the most discerning of guests. Once a home to numerous celebrities and famous faces, ... The surrey knows how to take care of its clientele, and with its elegant sense of design, plush-filled accommodations and soothing facilities, families, couples and business travellers alike are sure to find this residential-style haven the perfect New York City getaway. When it comes to New York City, style and chic are important aspects of everyday living, which is why The Mark Hotel is the perfect place to consider for your unforgettable stay. Situated on Madison Avenue, the hotel provides plenty of convenience to the sights and sounds of the city, ... with Central Park, Macy’s and The Metropolitan Museum of Art all in walking distance. Designed with the utmost care and consideration, The Mark Hotel embodies everything bold and beautiful about “The Big Apple” and serves as an idyllic place to start and end each day at the heart of it all. Guests are encouraged to ease back and relax in one of numerous accommodations, each more lavish than the next, utilise the many facilities and tempt their palates at the in-house bar and restaurant to get the full Mark experience. The Baccarat Hotel & Residences is a luxurious getaway nestled deep in the heart of New York City, a lavish escape that invites travellers to ease back and relax in between discovering the highlights of “The Big Apple”. Seamlessly blending the style and elegance of Paris with the modern comforts ... and conveniences of New York, the hotel serves as a warm and welcoming place that even the most discerning of guests can get the most out of, and with so many plush-filled accommodations to choose from, a number of in-house dining options and soothing facilities throughout, The Baccarat Hotel & Residences is sure to live up to such high standards. Situated deep at the heart of Midtown Manhattan, the St. Regis New York brings a sense of timeless style and comfort to travellers looking to immerse themselves in the vibrancy of New York City. Outfitted with chic-filled guestrooms and suites, a number of in-house dining options and plenty of facilities ... that are sure to entice, the hotel serves as the perfect gateway to your “Big Apple” experience. 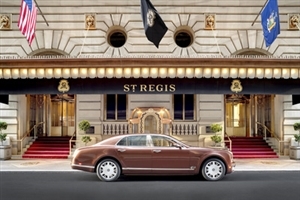 With so much to see and do in and around this urban haven, one stay at the St. Regis New York and you’ll see why it earned its AAA Five-Diamond rating. 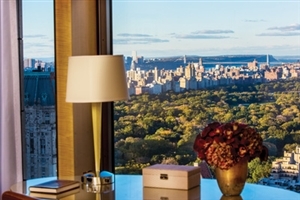 Ease back and relax in the lap of luxury at the Four Seasons Hotel New York, a world-class urban escape that takes the sights and sounds of “The Big Apple” and combines them with a level of style that has become signature with the Four Seasons brand. Mere steps from ... such local highlights as Central Park, Madison Avenue and the landmarks of Midtown Manhattan, the hotel is situated perfectly for those looking to explore and uncover the wonders of New York City. Choose from a number of lavishly designed accommodations, tempt your palate in the in-house dining venue or make the most of the facilities and services to get the most out of your world-class holiday experience.